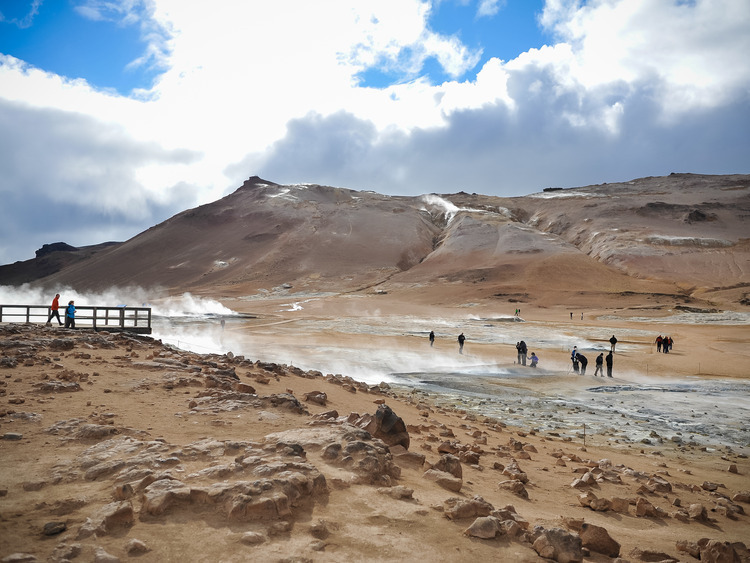 An excursion by air, flying over some of Iceland's most spectacular natural attractions: from the Tindfjöll, Eyjafjöll and Heckla volcanoes to the famous Golden Circle, through a wealth of unique natural landscapes that will leave lasting memories. Landmannalaugar, an unforgettably picturesque oasis. On this unforgettable aerial excursion we fly over the volcano and glacier of Tindfjöll. From this impressive vantage point we can see the Ýmir summit, the highest in the chain of mountains that stretches to the south of the glacier. Ýmir is the name of the legendary giant whose body, according to Norse mythology, was turned by the gods into the Earth. Next we'll spot the glacier that covers the caldera of Eyjafjöll, the volcano famous for having blocked international air traffic for days in 2010 due to its massive dust cloud emissions. Amongst glaciers and snowy expanses, we'll catch sight of Heckla, the most famous Icelandic volcano, considered in the middle ages to be the gateway to hell. It is a highly active volcano: the last eruption was as recent as the year 2000 and it is kept under close observation by geologists. We continue towards Gullfoss, the "Golden Falls" with its theatrical plays of light and the two cascades into the tumultuous waters of the river Hvitá. We then arrive at the geothermal area of Geysir, where we witness characteristic gushes of water and steam. We continue towards Þórsmörk, literally "Thor's Forest", accessible only by jeeps and specialised vehicles. It presents a difficult and magnificent landscape: a valley protected by three glaciers, crafted by the forces of nature and crossed by treacherous glacial rivers. We conclude this sensational tour with the incredibly picturesque Landmannalaugar, considered to be one of the pearls of the landscape. Thanks to the strong presence of rhyolite, it offers an extraordinary kaleidoscope of colours: the black lava and pink and blue cinders of the Bláhnjúkur volcano, the red, brown and yellow along the sides of the adjacent volcano, an obsidian lava field that stretches from the hot sulphurous springs to a stream of naturally warm water by a grassy oasis and the milky-white river Jökulgilsá which flows peacefully towards the ocean.